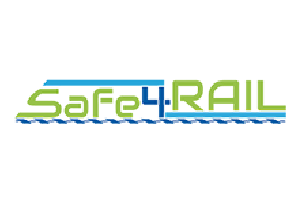 SAFE4RAIL provides the baseline for a fundamentally simplified embedded computing and networked TCMS platform, for modular integration and certification of all safety-, time- and mission-critical train functions, including distributed hard real-time controls, safety signals and functions up to SIL4. The generic embedded platform architecture provided by SAFE4RAIL allows mixed-criticality integration and virtualisation to host critical and non-critical functions on reconfigurable computing and networking resources. The project simulation and testing environment is based on the hardware abstraction and domain separation concepts allowing rapid deployment and testing of applications, e.g. by supporting early functional integration testing long before vehicle integration. The results are demonstrated with a SIL4 brake-by-wire system safety concept. Finally, the project provides recommendations for standardization and certification of next generation TCMS embedded platform. SAFE4RAIL reduces TCMS system lifecycle and operating costs and minimises time-to-market. It is also expected to encourage interoperability, efficient, safe and secure interconnection of technical solutions among European railway providers, boosting the worldwide competitiveness and preserving the global leadership of the European transport industry.